To increase the visual impact of the mosaic plot you can reorder the rows and columns to make the pattern more coherent. It is useful to re-order the categories so that the deviations from independence have opposite-corner pattern, with positive values running from bottom-left to top-right corners and negative values along the opposite diagonal. In the Variables list box. select Hair. In the Categories list, click and drag the categories to re-order them into the order: Black, Brown, Red, Blond. In the Variables list box, select Eye. In the Categories list, click and drag the categories to re-order them into the order: Blue, Green, Hazel, Brown. 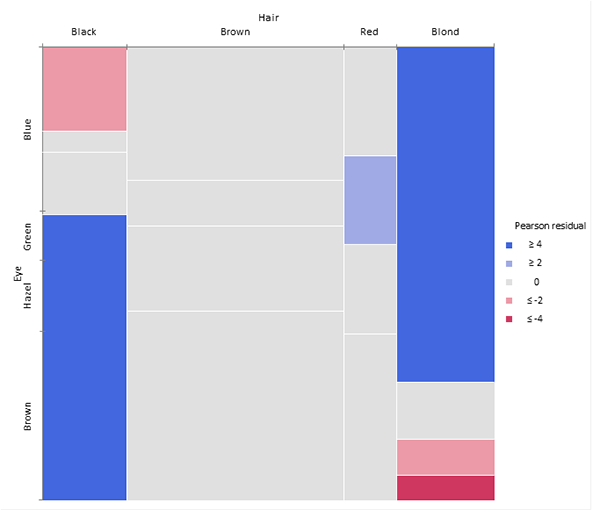 The over-representation of Black/Brown and Blond/Blue is now much more apparent, together with the under-representation of Blond/Brown and people with Black hair and Blue eyes. Although the table was reordered based on the residuals you can see that both dimensions are ordered from dark to light, suggesting an explanation for the association.